What can an Osteopath treat? Osteopathy is a recognised complete system of health care whose emphasis is focused on treating the whole person not just the presenting problem. It recognises that much of the pain that we suffer stems from dysfunction in the body's structure as well as from damage caused to it by disease and injury. One of the aims of osteopathy is to restore the body to its normal function and aid relief from pain thus allowing the body's natural healing mechanisms to function properly. Osteopathy uses many of the diagnostic procedures used in conventional medical assessment and diagnosis but its emphasis is in the unique way the individual is assessed for mechanical and functional capacity. When you first call the practice we will discuss your case on the telephone to ensure that Osteopathy and or Sports Injury care is suitable for you before offering you an appointment. You are welcome to be chaperoned to any of your appointments but we require under 18’s to please be accompanied by a parent or guardian. As a formality, at the beginning of your first appointment we will ask you to read and sign our terms and conditions statement which grants us your informed consent to continue with the session. The statement outlines: our credentials, how your information will be kept, how the session will be conducted and what to expect. The information from your case history is treated as confidential and is used as a basis for a physical exam and specific orthopaedic tests which may require you to dress down to your underwear. We will discuss our findings with you and outline what structure(s) in our opinion have been injured and how. If you are happy with the opinion treatment can then proceed with your permission. We like to talk you through your appointment so that you are informed as to our reasoning as the session progress, at any time during your appointment please feel free to ask questions. This varies from person to person and is dependant on the nature of the injury. It is practice policy to encourage you to manage your injury between treatments and to assess your progress at the beginning of each subsequent appointment. Generally speaking – a recent practice audit showed that an injury can usually be resolved in 2 – 5 treatments, unless a programme of treatment for a chronic condition or rehabilitation is necessary. However if a condition remains static we will discuss alternative options or help to refer you for further tests or investigations. All treatment procedures from any profession have the possibility of creating a ‘side effect’ or treatment reaction to some degree. 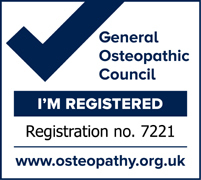 Osteopathy is not an exception in this respect and legally we are obliged to inform you of this fact. Your treatment programme is developed from your case history and examination findings, its aim is to reduce your pain and discomfort and aid your return to your normal activities. Osteopaths are experts in focussed adjustment techniques, however Osteopathy is not just about joint manipulation and only appropriate treatment techniques will be utilised subject to your informed consent. The practice sees your treatment programme as a partnership and welcomes you to express any preference to treatment techniques. With direct manipulation of the neck there is an extremely rare chance of damage to arteries in the neck which could possibly result in stroke. Evidence varies but studies put occurrence of this risk at somewhere between 1 in 100000 and 1 in 5 million and should be considered in the context of common everyday activities that we take for granted that involve turning of the head. Osteopaths are trained to recognise any signs that suggest unsuitability for manipulation and will investigate this through a thorough case history and examination. If there is any doubt as to the safety of applying a technique then it will not be used and we will discuss appropriate options to continue your treatment.